The approximate monthly cost of care for this provider is around $4,355. This is less than the American Falls average cost of $4,536. The average estimated expense throughout the State of Idaho is approximately $4,368, which is above the US estimate of $4,221. Spring Creek in American Falls is located in American Falls, Idaho. They provide senior care in a clean community for older individuals. The area surrounding this community has a sparse population, including around 6,374 residents in the surrounding zip code. It is a primarily middle income area, with a median family income of $37,498. The facility is located near many local amenities, which include healthcare facilities, churches, and shopping. There are 6 churches within 4 miles, including Church of Jesus Christ of Lds, Catholic Church St Marys, Assembly of God, and American Falls Congregational. There are 4 drug stores within a mile of the facility. They're also located only 0.3 miles from Harms Memorial Hosp District. Spring Creek in American Falls offers nursing home care, dementia care, and assisted living. They can care for seniors who are severely infirmed and need assistance with daily activities but also need to have frequent access to health care services. Also, they can provide for seniors at all levels of dementia or Alzheimer's who need assistance with routine tasks and monitoring to prevent wandering. 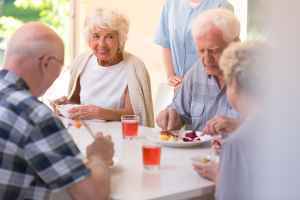 Additionally they can house seniors who need assistance with routine tasks but who also want to maintain some degree of independence. This residence has many services and amenities available to their clients. For example, they provide a selection of personal services such as transportation services. Additionally, they have different food selections including Kosher options, low sodium options, and vegan and vegetarian options. They also have different room amenities that include in-suite washers and dryers available, maid service, safety and handicap fixtures, and in-room cable television.